We review Bandido, a cooperative card game published by Helvetiq. 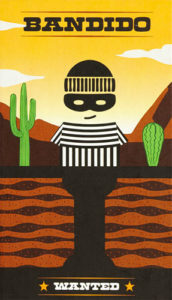 In Bandido, players must work together to stop the prisoner from escaping by playing cards to close off the tunnel exits. There is something to be said for games that have a small form factor. A game that you can toss in a bag or purse and bring with you on the go. Some of my fellow writers here at BGQ even have “pub night” where they play games at their local brewery. That’s where a travel sized game works perfectly. Publisher Helvetiq has been offering a number of games that seek to fit the bill for travel friendly. Kariba, Hippo, and now, Bandido. 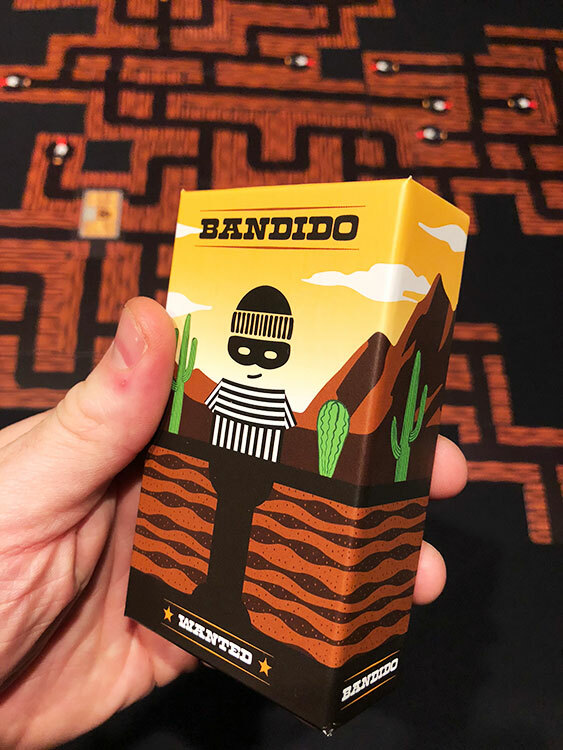 Bandido is a cooperative route building game for 1-4 players that takes about 15 minutes to play. The goal in Bandido is simple. Plug up all the prisoner’s tunnels before he escapes. The game starts with the prisoner’s cell tile that has 5 exits, and each player has a hand of 3 cards. On a players turn, they simply choose a card from their hand to play into the table. The ends of the tunnels played must match up perfectly, so you can’t have a tunnel running into the side of a card without a matching tunnel. After playing a card, the player draws a replacement and the next player takes their turn. 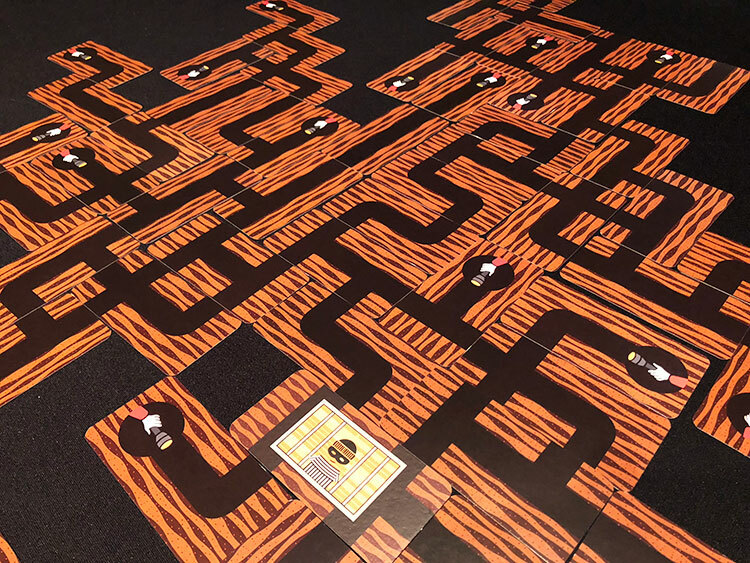 The game ends when either all tunnels have been plugged up, or the deck runs out and the prisoner escapes. The game will take up a lot more table space then you might expect. In case you can’t tell from the above, Bandido is about as simple as it gets. Well simple to learn that is. Teaching the rules should take about 30 seconds and setup consists of just shuffling the deck. So if you are looking for a game that you can jump into quickly, Bandido fits the bill. That being said, Bandido is also pretty random. The cards vary from having only one open end to having four. Some turns you will have to play a card that makes your position in the game even worse and there isn’t really anything you can do about it. This is truly a game where you are at the mercy of the draw. I played a game where we won after only a few minutes because we drew all the best cards right away. However, more than likely, you are going to be stuck with lots of open tunnels and lose the game. There are just too many cards with lots of connections, and if you don’t get the right ones at the right time, it’s a losing battle. The box is quite small and would be easy to take on the go. While in its case, Bandido has a very small footprint. The case is about the size of a deck of playing cards. However, what we didn’t expect was the footprint of the game is rather large. You will need a lot of table space to play Bandido. So while this looks like a game that could be played on a small table while on the go, it definitely is not. I think the best audience for Bandido will be young kids. There just isn’t enough here to keep most gamers or adults interested. After a while, the game gets fairly mindless and repetitive. However, the rules and setup are simple enough that even young kids can play without an an adult’s help (after they’ve played once and learned the rules). I could easily see this being a game you toss to your kids to keep them entertained while you do important grown-up stuff. Bandido is one of those games that seemed to be a neat idea, but didn’t hold up well in execution. For me, it was just was too random and repetitive. I like having a bit more control over my destiny and there really isn’t any of that in Bandido. However, as a mindless filler game or something to occupy the kids attention, it can work well. Just don’t let the small packaging fool you, you need quite a bit of table space to play this one. Final Score: 2 Stars – A neat idea that just doesn’t hold up well in execution.